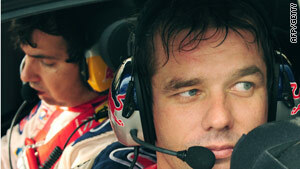 Loeb and co-driver Daniel Elena duly completed yet another title triumph. (CNN) -- Sebastien Loeb wrapped up his sixth straight world rally title by claiming victory in the final round of the championship on Sunday. The Frenchman went into the Wales Rally GB trailing arch-rival Mikko Hirvonen by a point, but relegated the Finn to second place with a commanding drive in his Citroen. Loeb led Hirvonen by 30.2 seconds overnight, but the Ford Focus star won the first two special stages to close to within 18 seconds. But Hirvonen's challenge came to an abrupt end on the penultimate stage as his bonnet flew open and he lost over a minute. Loeb and co-driver Daniel Elena made no mistake on the closing 27 kilometer Rheola leg and climbed on the roof of their car to celebrate yet another world title and the 54th win of their record breaking career. "It's been an incredible season," a delighted Loeb told the official world rallying Web site www.wrc.com. "This has been one of my best title wins; the battle was so intense - going almost until the end of the last rally. It was incredible. We have had some highs and some lows this year but we finished with the victory. It's an incredible feeling," he added. This has been one of my best title wins, the battle was so intense. It's an incredible feeling. Hirvonen and his co-driver Jarmo Lehtinen did enough to secure second place and were the first to congratulate the winners. "Now I need to go back to work and find more speed for next year. It was definitely the best year I've ever had, though," said Hirvonen. To complete a superb day for the Citroen team, Loeb's teammate Dani Sordo claimed third place to secure third in the championship standings. Petter Solberg of Norway claimed fourth. The results left Loeb with 93 points, just one point ahead of Hirvonen, with Sordo on 64.